My Saturday nights as a pre-teen were often spent swapping baseball cards with friends. My best friend lived three houses up the street and was my main trading partner. We’d often have sleep-overs filled with wrestling videos, video games, and an all-out baseball card exchange. Yes, I was (and still am) a huge nerd. While going through my old collection, I came across the crown jewel of most baseball card collections from the early 90s. 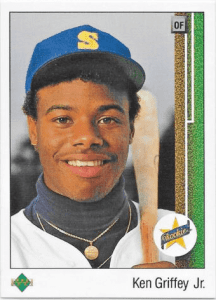 A Ken Griffey Jr. 1989 Upper Deck rookie card. First of all, it makes me feel super old that Ken Griffey Jr. has been retired for eight years (and let’s be honest, he’s pretty much been retired since 2000 when he left Seattle). Even though most of the cards in what’s left of my collection are worthless, it got me thinking about all of the life lessons that collecting baseball cards taught me as a youngster. Collecting cards taught me how to negotiate with friends and vendors at a young age. It also taught me how to make what seemed at the time like tough and sometimes emotional decisions. As silly as it sounds, I used to get connected to cards in my collection. And finally, it helped to estimate the future value of an asset. Even my decision to major in finance was in some ways driven by collecting baseball cards. My mom used to say, “You should be a stock broker, it’s like trading baseball cards only with stocks!” While this didn’t make much sense at the time, I can see the connection now. Baseball cards are an asset with a present value based on a variety of different factors. The goal is to predict the future value of the asset to maximize return. 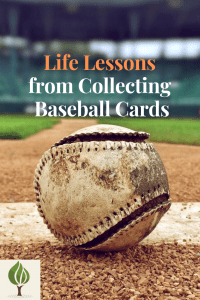 Below are a few of the life lessons I’ve learned from collecting baseball cards as a kid. As a kid, I spent a decent amount of time scouring the local newspaper in search of baseball card shows. If you’re not familiar with baseball card shows, they were usually held at hotels or conference centers and the rooms were filled with pudgy middle-aged men. Tables were set up in large conference rooms with people looking to buy, sell, and trade baseball cards. Some vendors sold individual cards. Others would sell boxes or packs of cards. Most were some mix of both. My preparation for baseball card shows would involve the meticulous process of building my “selling binder”. This binder would include the baseball cards that I wanted to try to sell to baseball card show vendors. This put me in situations as a 10-13-year-old where I was negotiating the sale of my prized baseball cards with grown adults who had much more experience negotiating than I did. As you can imagine, they often tried to take advantage of my youth and lack of experience with low-ball offers. Becoming a strong negotiator only comes with experience. It was really intimidating at times to walk up to someone three times my age and try to strike a deal. However, those skills learned at a young age have transitioned to many different aspects of my life. For example, in college one of the ways I made money was by buying items at garage sales to resell on eBay. You can bet that I used to negotiate at garage sales to get prices down from the sticker price. No, I didn’t waste time negotiating $0.50 down to $0.25, but I most certainly did try to get $30 items for half the price. Now that I’m older, I have to negotiate almost daily with co-workers to ensure goals are met. It has also helped during higher leverage situations such as when discussing salary or new work responsibilities. Almost all of us negotiate on a daily basis even if we don’t realize it. Thus far, my toughest counterpart has been my 4-year-old. Have you ever tried to negotiate doing chores with a little boy? I still haven’t figured it out. Regardless of who you’re negotiating with, the more practice you have, the better you’ll be. Collecting baseball cards is a lot like managing a stock portfolio. Each card or stock has a perceived value that the asset can sell for in the open market, it can increase or decrease in value, and it can go broke in a moment’s notice. 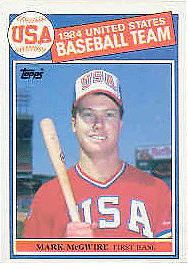 Baseball cards are usually valued on the underlying performance of the athlete on the field. Similarly, stocks are valued on the underlying performance of a company. The same logic can be applied to other asset categories such as owning a small business or real estate. Sometimes the underlying asset is related to a player’s off-the-field activity as well. My favorite player growing up was Mark McGwire. My best friend’s favorite was Barry Bonds. In the early 90s, we used to have passionate arguments about who was the better player. I’ll never forget the epic home run derby between the two in 1996. Being a St. Louis native, you can imagine my excitement when McGwire was traded from the Oakland Athletics to the St. Louis Cardinals in 1997. I still remember that day in late July when the trade happened. I was playing baseball at the school yard behind my house. My dad ran outside to let me and my friends know that the Cardinals had obtained McGwire. As a 14-year-old, that was the best day of my life up to that point. It sounds silly, but to have the player that you idolized traded to your team was amazing. The 1998 season ended up being one of the most memorable in history with McGwire and Sammy Sosa of the Chicago Cubs dueling it out to break one of the most prolific records in all of sports- Roger Maris’ home run record of 61 set in 1961. After a baseball strike in the early 90s, the 98 season was believed to have officially brought baseball ratings back. And it was all happening a few miles from my house with the main character being my long-time idol. Along the way, I had collected hundreds of Mark McGwire baseball cards and other memorabilia. I had every Starting Lineup (basically an action figure) of McGwire from 1988 until his retirement. After he broke the home run record, he was thought to be a lock for the Hall of Fame. While secondary to the memories, I couldn’t help but think about the value of the hundreds of cards and other memorabilia that I had collected over the years. How much would all of this be worth years down the road? Then, in an Enron-like collapse, all the sudden the epic collection that I had built was basically wiped out overnight. Mark McGwire was accused of using steroids (or steroid-like supplements). Even though steroids were not banned from Major League Baseball at the time, they were an illegal drug. Mass hysteria ensued and any ballplayer with even the smallest connection to steroids was black-listed. This included McGwire, Bonds, Sosa, and hundreds of others. Even though McGwire and Sosa almost single-handedly brought baseball back in 1998, they were thrown under the bus and characterized as outcasts. Just like any asset, the value of it can be wiped out overnight. You can make all of the right calls in trying to determine the future value of an asset, and just like that it can all go to nothing. This happens all the time with stocks, businesses, and real estate. This is important to keep in mind. Sure, you should use all of the information you have available, but be sure to diversify since predicting the value of a future asset can be unpredictable. When you get involved in a passion project it can be challenging to separate the emotion from the business aspect. You hear this all of the time with real estate investors. Many investors are successful because they are able to take the emotion out of the decision making process. Collecting baseball cards was like that as well. When you open a pack of cards and stumble upon a valuable card, it can be emotional to trade or sell it to someone else. That experience becomes a part of you. By trading away that card you are losing a small part of that memory. When you flip the page on your binder and see that card, it brings back a tiny piece of that joy you had when you got that card. One of my other favorite players was Chipper Jones of the Atlanta Braves. I remember one card in particular where I had strong emotional ties. 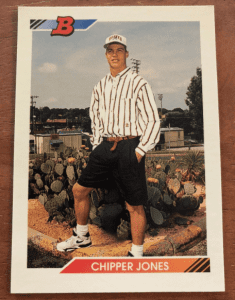 It was a 1992 Bowman Chipper Jones card that was worth somewhere between $25 and $50 at the time. For months during our almost weekly trading sessions, my friend tried to get me to trade him this card. This was one of my favorite cards in my collection. At one point, my friend offered what was nearly triple the value of the card. I still said no and still have the card today. This is where the delicate balance between emotional value and financial value comes into play. Only the individual can determine what is more important, money or happiness. This taught me the importance of being able to distance myself from the emotion of work and business where possible. There are plenty of areas of life where it’s perfectly fine to choose the emotions of happiness over business. However, there are other areas where it’s important to separate your emotions from business decisions. This happens a lot in my day job. There are often stressful situations that come up regarding personnel or high profile projects. Being able to keep my emotions separate from the business side is important. It’s also important to know when it’s okay for my emotions to come into play. The ability to negotiate with others has been one of the most important skills learned from collecting baseball cards. Being willing to step outside of my comfort zone to negotiate with vendors taught me a lot about negotiation and communication. Approaching adults to negotiate sales took a lot of courage as a pre-teen. I’m sure I was ripped off at times, but it definitely gave me experience negotiating with strangers at a young age. 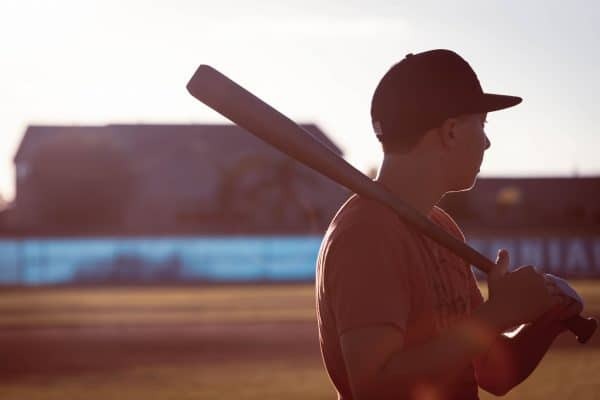 Collecting baseball cards also helped me understand the risks involved with valuing future assets and has allowed me to better control my emotions in business situations. Therefore, even though the majority of cards in my prized collection are worthless, it’s tough to put a price on the life lessons I learned by collecting baseball cards. Did you collect baseball cards as a kid? Are there any other important skills that you learned as a result? Great post and a unique perspective on investing! As a St. Louisan, the McGwire/Bonds home run race was unforgettable. My wife was actually at the game for number 62! High five to another St. Louisan! That summer was so awesome. I’ll never forget the great memories. I wasn’t at the game for 62, but did go to the stadium after he hit it. Also, completely random but my old boss caught (picked up) #61 and GAVE IT BACK! He could have made a lot of money from keeping it. I’m not sure I would have done the same.